Augusta Free Press LLC recently turned four print books published by AFP into ebooks available online via Amazon Kindle. 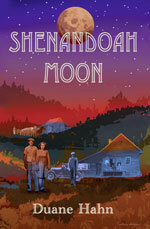 Shenandoah Moon written by the late Duane Hahn was released as an e-book for $4.99. Looking Through the Rain, also by Hahn, was released for $3.99. Looking Over My Shoulder by Steven Britt was also released for $3.99. The Hen and I by Chicago-based author Michael Waltz is also now available online for $3.99. Anyone with the Kindle app may download the books via Amazon by searching the book title or author name. There is also a Kindle app available for your PC.